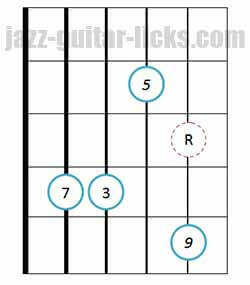 Major 9 chords are built with a root (1), a major third (3), a perfect fifth (5), a major seventh (7) and a ninth (9). 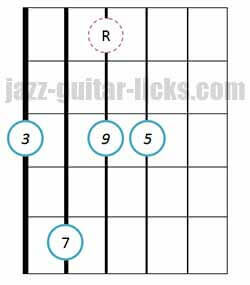 A maj9 is simply a major seventh chord with a ninth added. 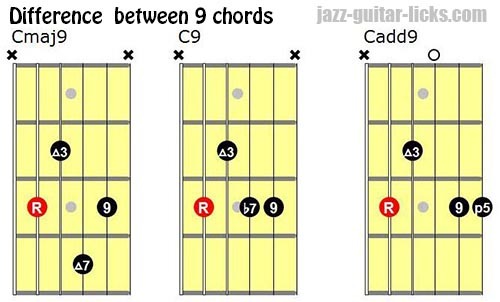 Major 9th chords can be noted M9 or maj9. 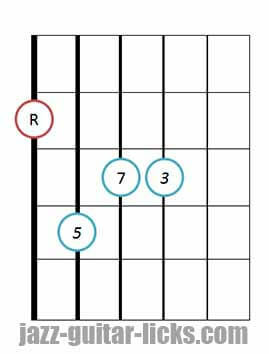 For those who don't want to experiment drop 2 chords, here are two basic chord shapes to play maj9 chords on the guitar. 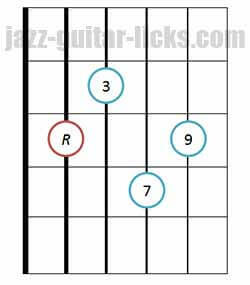 The first diagram has its root on the sixth string and the second has its root on the fifth string. 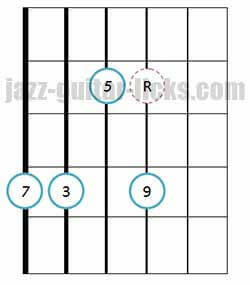 Because guitarists don't have enough fingers to play the five notes of these kind of chords, the fifth is omitted. 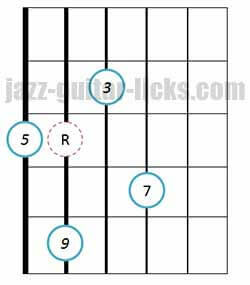 It's better to omit the fifth or even the root than the seventh, the third or the ninth that are most important and give the color of the chord. 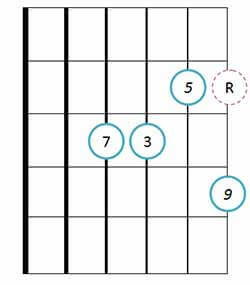 Here are 12 guitar diagrams to play drop 2 major ninth chords. 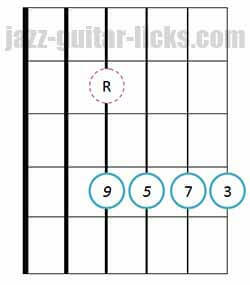 These diagrams are based on the drop 2 major seventh chords. 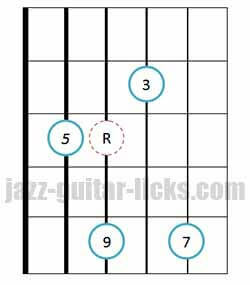 To build a drop 2 maj9 chord you just have to move the root 2 semitones (two frets) up to get the ninth. 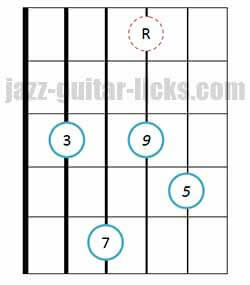 As you can see, root notes are dotted in red in the following diagrams, they are nor played, but it is important to locate them to find more easily the chord position on the guitar neck and as well as its name. 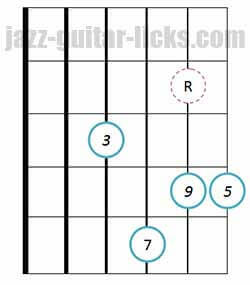 Because the difference between a maj9 and an add9 chord is often a source of confusion, this has to be clarified here. 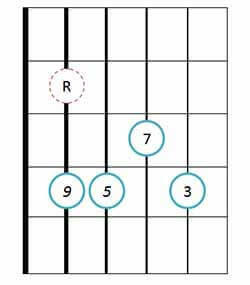 A maj9 chord needs a major 7th in its composition, this is just a shorter way of saying maj7add9, that's what makes it different from add9. 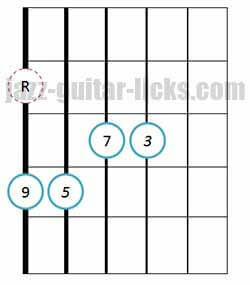 In other words, this is a major seventh chord with a ninth. 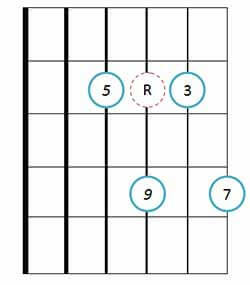 An add9 chord is a major triad with a ninth added. 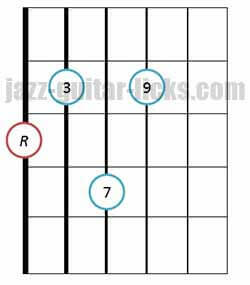 A 9 chord is a five note chord, it's a dominant seventh chord with a ninth. As you can see in the voicing shapes below, the fifth is left out.